Jazz, cake, ducks and a sheep called Baahney! I have just had a wonderful weekend helping out at the Marsden Jazz Festival . I was there all weekend (out till well past my bedtime on Saturday as I was stewarding at the late night event!) and finally got home at 10 on Sunday – a bit tired but very pleased that all went well. I saw a few bands play which was great but most of my time was spent manning the box office selling tickets and a bit of whizzing round Marsden checking that bands were ok and the punters were happy – oh and collecting money so that we can run the festival next year! This year was the 19th year that the festival has been run and there were over 60 live music events over the weekend – every pub and club in and around the village hosted at least one band – many had four or five so it was an absolutely massive feat of organisation – I only joined the committee in July by which time most of it had been done but it all went very well. There were 12 ticketed events which was why we were running the box office but all other events were free. It was so much fun and I am very, very grateful to all of the committee for being so welcoming and making me feel so included.I also made some new friends from some of the other volunteers which was great. Music wise I got to hear my fave combo String Fellows , Jacuzzi 500, the Huddersfield University Band and a bit of Blue Toots, Jackie Dankworth (who I also got the chance to meet – she is lovely and very beautiful as well as having an amazing voice), Dizzy Club and Orchestra DC Dansette. It was a really buzzing weekend! 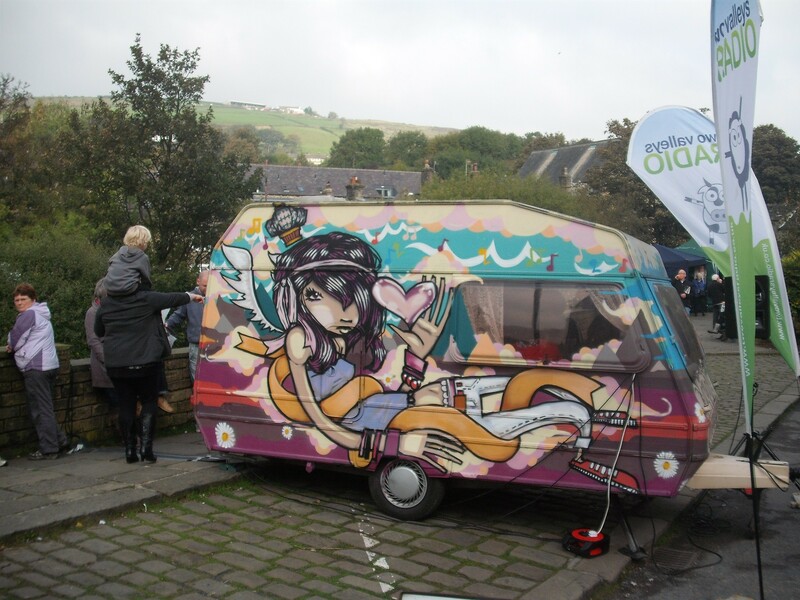 I was also interviewed live on radio for Two Valleys radio in their ‘Caravan of Love’ on Saturday about being a volunteer – have yet to listen to that yet but the broadcast from the whole weekend is on their website so will try to find my bit .Pic of the caravan below – isn’t it fab! There was also cake – lots of it keep us going all weekend (and fish and chips and lovely pie and peas – great Yorkshire grub!) – I had to take a pic of this little cupcake which was being sold by one of the local cafes Crumbals – how cute is this – and it tasted very lovely! 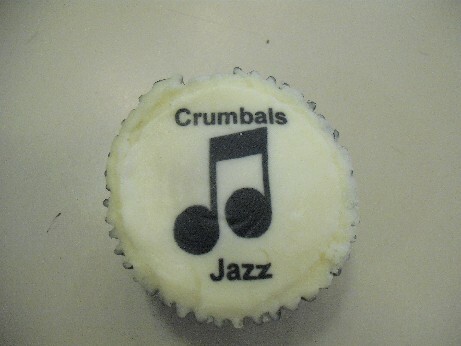 The Jazz Festival cup cake - limited edition -all eaten now! 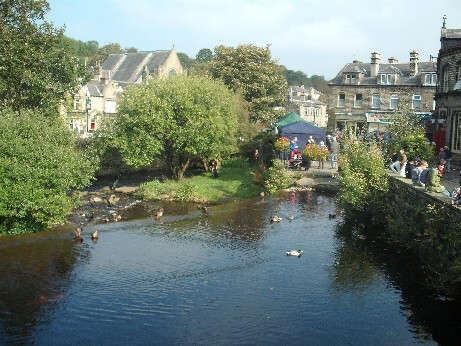 Marsden is a very pretty village with the River Colne running through it and many of the events were centered round the river including a Duck Race ( yellow, plastic ones not real ones ) organised by the National Trust. I love feeding the ducks whenever I visit.I took this pic on Sunday when it was lovely and sunny! Marsden is also famous for its sheep who roam around in the village , invading people’s gardens and eating their plants, lolling in the middle of the road and generally being woolly and the sheep is a feature of the Jazz Festival publicity – being on all the posters and T-shirts. 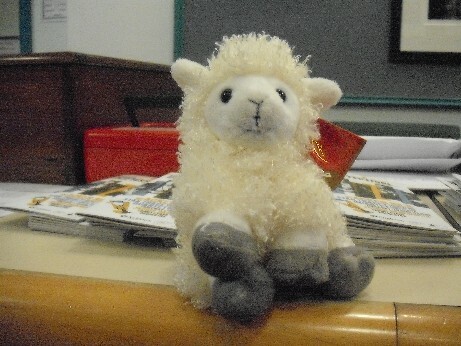 This year one of our merchandise items was toy sheep and I couldn’t resist buying one – who I have named Baahney in honour of the festival committee chairperson who is called Barney. Here he is manning the box office with us. 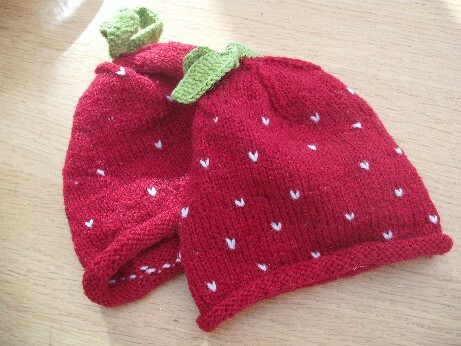 Anyway back to crafting news – I have just taken possession of some fab knitted items – not made by me but by one of my students, the very talented Juliet who runs her own business selling knitted hats – these are Xmas pressies for the family babies – how cute are they! Thanks very much Juliet – excellent work. And I have finally (big drum roll….) joined the local quilting group – something I meant to do about 18 months ago and kept being too busy to make it but I went tonight and listened to an excellent talk by Vivien Finch who showed us some of her vast collection of quilts including many vintage ones.I had a very warm welcome from all the members which was lovely and I will be joining them on Saturday for a sewing day so I will get the chance to cut out my Xmas hanging. Am also planning a trip to the one of the local museums for their knitting afternoon on Sunday so am looking forward to another textileiciuos weekend! Hope you have something nice planned. Hi Alison, I’m your partner for the ASOE Halloween round. Could you please send me your contact info to karriestitcher@gmail.com my computer recently crashed and I’ve lost your address. Glad you had a good time – it all looked good fun and meeting a jazz celeb too! I love the beanie hats. I love the beanie hats.does your student have a shop or on line store? I am not certain – I think she does so will ask her and post details.